Oakland High School students have started a petition in support of a staff member accused of handcuffing, punching and dumping a student with cerebral palsy out of his wheelchair. According to a letter sent out to parents by school principal Matin Abdel-Qawi, the staff member -- named in an official complaint as security officer Marchell Mitchell -- has been arrested and charged with injuring a child, a felony. He was fired May 19, the same day as the incident. Mitchell was arraigned last week and pleaded not guilty, according to the Alameda County District Attorney's office. On Friday, some students started a petition in support of Mitchell, who was caught on video hitting the student in a wheelchair. Mitchell claims the student provoked him by spitting on his face at one point during the incident. Students taped flyers to themselves, which read: "Spitting is a crime, you provoked this ... Spit on me get yo a** beat." The Oakland Unified School District has released a video of the incident. According to the probable cause document filed in court, the student, 17-year-old Francisco Martinez, has cerebral palsy and can't use his legs. Martinez said Friday that he's still traumatized by what happened last week. "All I'm asking for is justice," he said. "It affects my studies because everybody is just watching." Abdel-Qawi said that around 9 a.m. on May 19, two school security officers were urging students to go to class. But some of the students, including one in a wheelchair, continued to linger in the hallway. When one of the security officers approached the student in the wheelchair and ordered him to move toward his next class, the student either refused or was slow to do so, Abdel-Qawi said. The officer then proceeded to take the student’s chair by its handles and wheel him to class, at which point the student objected and attempted to slap away the security officer’s hands, Abdel-Qawi said. 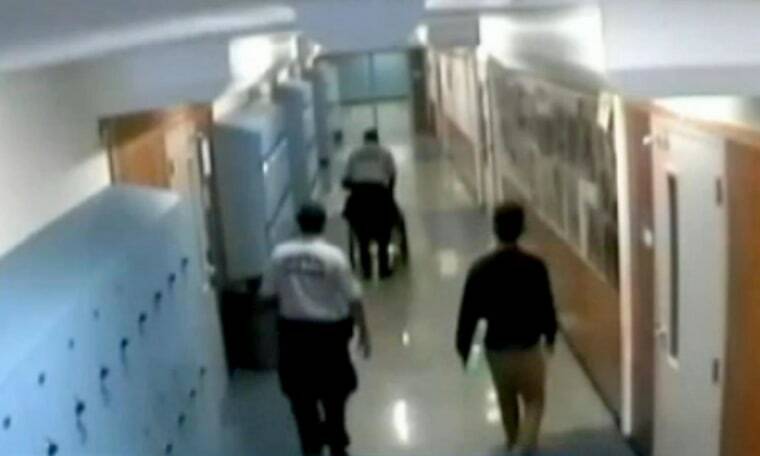 The security officer handcuffed the student and continued to roll him toward class when the student turned around and spat on the officer’s face. The security officer allegedly struck the student several times before dumping him from his wheelchair onto the floor face down. Another security officer intervened to restrain his partner. A staff member arrived at the scene moments later and notified Oakland School Police, who detained the security officer and launched an investigation that included interviews with students, teachers and administration. The student was transported to a hospital with injuries. He has since returned to school. "We consider this behavior completely unacceptable, harmful to our school and community, and traumatic to our students and families," Abdel-Qawi said in his letter. Police are still investigating the case but there was enough information to conclude that criminal behavior took place, resulting in the arrest of the officer by Oakland School Police for child abuse, Abdel-Qawi said. Abdel-Qawi said that he had called a staff meeting on May 20 to respond to the incident. Oakland Unified’s legal office and Oakland School Police are also reviewing policies and training procedures related to school security officers, he said. The school district is reviewing the surveillance video to determine whether other guards responded poorly to the incident as well. The next court dates are scheduled for June 16 for pre-trial and July 11 for a preliminary hearing.